Here’s something you don’t see everyday. Brewster & Co. were a famous coachbuilding company based in New York as well as the American importers of French Delaunay-Belleville cars (rare enough in their own right). They were also the largest coachbuilder for Springfield, Massachusetts-based Rolls-Royce of America (and British Rolls-Royce once their American arm shut down in 1931). During the First World War, Delaunay-Bellevilles were hard to come by and Brewster turned to building their own cars. This 1915 Model 41 was from the first year of manufacture and it featured the sleeve-valve Knight engine – as did so many other [Company Name Here]-Knight branded automobiles. The 40 horsepower four-cylinder engine was quiet – and expensive. Perhaps too expensive as Brewster-Knight built roughly 500 cars before Rolls-Royce of America acquired the company in 1925. The pre-sale estimate on this car is $60,000-$80,000. I’ve seen some Brewster-bodied cars (notably those Brewster-Fords with that curvy, pointed grille) sell here and there but I don’t recall a Brewster-Knight. 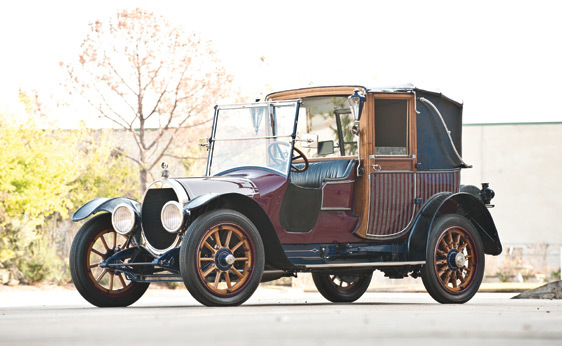 The auction catalog says this car was probably built in 1916, even though it is title differently. Read for yourself here and find out more about the auction here. This entry was posted in Uncategorized and tagged 1915, auction, brewster, brewster-knight, cars, classic car, knight, landaulet, model 41, RM, rm auctions by classiccarweekly. Bookmark the permalink.